Remember the freshness of gingham fabric? 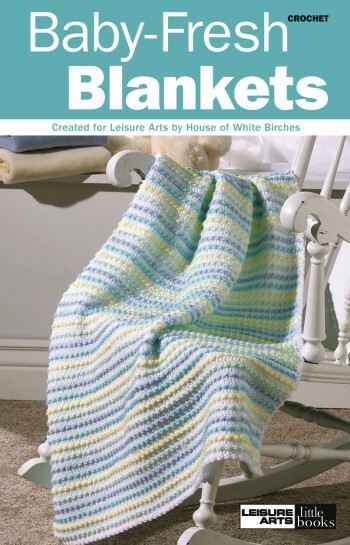 You can get the same look with this book's Beautiful-in-Blue Baby Afghan featuring color-block panels. Or you can treat your toddler to a rainbow of fresh colors. Dainty, textured stitches worked in pretty pastels make the Cotton Candy Stripes afghan as cute as it is cuddly. In the Lavender Lace Baby Afghan, an elaborate edging of love knots and picots accents a simple seed stitch body. Four baby afghans to crochet (3 easy designs in light worsted weight yarn and 1 intermediate design in fine/baby weight): Beautiful-in-Blue Baby Afghan courtesy of Spinrite; Rainbow Nap-ghan by Frances Hughes; Cotton Candy Stripes by Aline Suplinskas; and Lavender Lace Baby Afghan. Softcover � 16 pages.